The newly elected Prime Minister‚ Mian Muhammad Nawaz Sharif took oath of his office at a simple but dignified ceremony at Aiwan-e-Sadr. 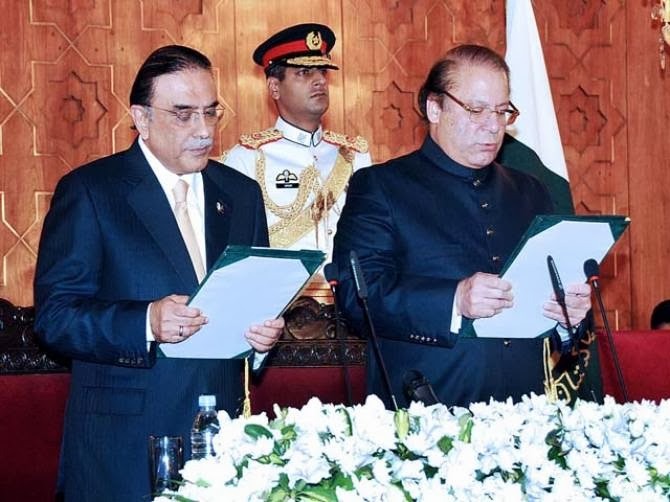 President Asif Ali Zardari administered oath to the new Prime Minister. Among others who attended the swearing in ceremony included outgoing caretaker Prime Minister Mir Hazar Khan Khoso‚ members of the former cabinet‚ members of the parliament‚ services chiefs‚ politicians‚ diplomats and high officials. Earlier‚ the National Assembly elected PML-N chief Nawaz Sharif as Leader of the House by the two third majority. He got 244 votes while his opponents Makhdoom Amin Fahim of Pakistan Peoples Party Parliamentarians bagged 42 votes and Makhdoom Javed Hashmi of Pakistan Tehrik-e-Insaf secured 31 votes. It is the first time in the history of the country that Mian Muhammad Nawaz Sharif has been elected for the slot of Prime Minister for the third time. Meanwhile‚ Speaker Sardar Ayaz Sadiq and Deputy Speaker Murtaza Javed Abbasi have congratulated Mian Muhammad Nawaz Sharif on his election as Prime Minister. In their felicitation messages‚ they said election of Mian Muhammad Nawaz Sharif was an evidence of trust and confidence of the representatives of the people in his leadership and abilities. They expressed optimism that under the dynamic and sagacious leadership of Mian Muhammad Nawaz Sharif‚ the country would successfully be steered out of the prevalent challenges. The Deputy Speaker also congratulated Mian Muhammad Nawaz Sharif on his election as Prime Minister of Pakistan.